Corn salad (Valerianella locusta) is also known as lamb’s lettuce, and has a delicate very mild flavour with soft leaves that almost melt in the mouth. 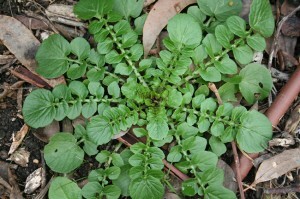 The leaves are pale green and rounded and grow in small clumps. You can pick the leaves individually or cut whole plants just above the ground, they will re-shoot. Plants only reach about 30cm in height. There are cultivars with golden, extra large and darker green leaves. Grow corn salad in temperate and cold regions from seed sown in autumn, winter and spring—in hot weather it goes to seed almost immediately. I find that mine goes to seed in spring, then disappears until autumn when the plants appear again in a dense clump. In contrast landcress (Barbarea vulgaris) self sows in summer and plants appear again in odd corners all over the garden all year round, but most prolifically in autumn. Landcress is also sometimes called winter cress or yellow rocket and is easily grown from seed planted in autumn and spring. It’s a tough, undemanding plant that grows as a rosette of dark green leaves from which stalks, with smaller leaves and a profusion of yellow flowers, grow in summer. It can grow as tall as 70cm when in flower. Both corn salad and landcress will grow in most soils as long as they are well drained, and they like open sunny or semi-shaded positions. 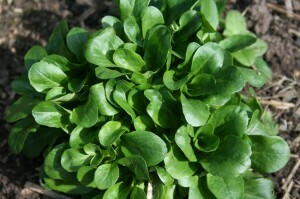 Landcress has hot, spicy crunchy leaves, similar to watercress, that are high in minerals and vitamins, especially vitamin C.